We provide fishing trips for groups, corporate businesses and individuals leaving from Westhaven Marina in Central Auckland. 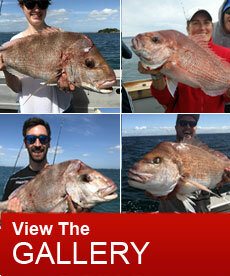 Welcome to Auckland's Best Fishing Charter ! 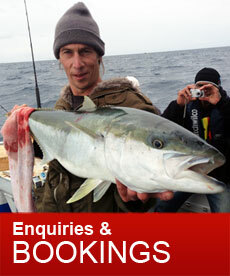 Come aboard our Fishing charters in Auckland and experience the very best in fishing that New Zealand has to offer. 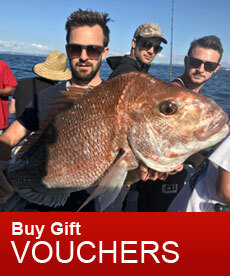 We run fishing charters for Snapper and Kingfish all year round, departing from Westhaven Marina in Central Auckland. We have Half day, full day, extended full day and evening fishing trips to choose from depending on the amount of time you want to spend on the water and the species you wish to target. We fish anywhere in the inner and outer Hauraki Gulf including the Great and little Barrier, the Mokohinau Islands and all the beautiful extended Islands that the Gulf has to offer. To make your experience a memorable one we have quality charter boats and experienced skippers who have fished the Hauraki Gulf for many years and can maximize your chances of landing that trophy fish. It does not matter what your experience levels are as we cater for both the experienced and the novice. The friendly skipper will give you all the help required to quantify your catch. It also makes a great outing for the kids if you want to bring them along. The day and evening trips are very popular depending on the season. Putting you on the fish in a relaxed and professional environment is always our priority when you are on our Auckland fishing charters. Our boats are clean, fast and comfortable and we cater for individuals and small to medium size groups. This gives everyone enough space to fish and have a very enjoyable time. Our boats cruise at 22 knots so we waste no time in taking you to the fishing grounds quickly. Which also means that you get more fishing time. Moving from one spot to another is also quick if we have to relocate and find the fish. Yes, the boat has a walk in toilet and a cabin area for everyone’s comfort. The boats carry all the modern safety equipment on board and are surveyed and audited regularly in keeping with Maritime New Zealand standards. Our prices are very affordable and competitive - you will surely get what you pay for! 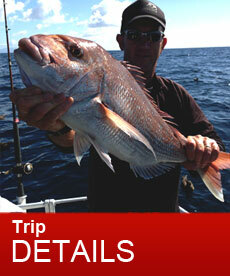 Please make an informed decision when booking a fishing charter. Yes we all want cheap prices, who doesn’t? But don’t let a few dollars less compromise you having a great day out. Do not look for a cheap fishing charter, instead look for an affordable and good one. Remember you do not go out fishing every day! But when you do go out you want a boat that’s clean and comfortable with not too many people on board. You also want a fast boat that can get you to the fishing spots quickly and give you the most fishing time possible. You would want a friendly and knowledgeable skipper whose skills help you in making your day one to remember. The list could go on and on – "Come aboard and give us a chance to help you experience this yourself". So whatever your needs, Give us a call or send us an email and we can tailor a package to suit your requirements. Overnight trips with accommodation can also be arranged for multiple day packages. While you are on our website, take a look at our other pages, there’s lots of little tips and tricks that will help you with your own fishing.